This is a story of twenty-five years firing my kiln; becoming friends, like a fine wine, takes time. 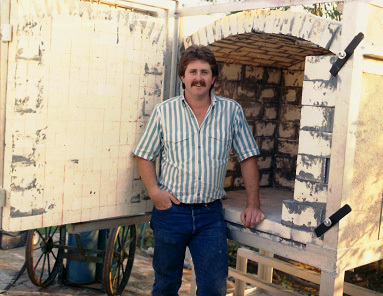 I designed and built my thirty cubic foot updraft kiln when I was 28 years old. Now I find myself at 53 years old (2013) looking back at how much I have learned, and how much has changed; I look forward to my future continuing to produce pottery with all its colors and textures that will outlast us all. Learning is a lifelong process for all of us. Looking back now, I realize that by building my own kiln and forcing myself to continue to load and fire it, I have gained insight that just cannot be bought. Over the years, I have developed thousands of colors and textures. Staying with the same chemistry and engineering has allowed me to continue to perfect the way my kiln produces pottery. Every kiln is different. And no glaze is ever the same due to the fact that every firing is different. The way the gas flows through a kiln is dictated in part by how it was loaded with pottery and shelving, as well as how the ultimate temperature is reached. A clay body always influences the final product in ways that can only be imagined. Take, for instance, using porcelain and comparing it to a strong course red stoneware clay body, using the same glaze on both. No matter the glaze, a porcelain clay body will for sure give a much brighter and smoother finish. So many things like that can be explained in a book but until a person completes the hands on laboratory/shop work, (one) could never truly know or understand the difference. 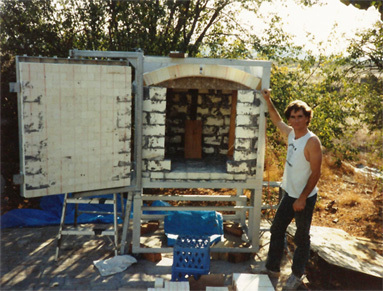 When I started this journey, I had to learn to design a kiln including the firing system. That subject has taught me so much; the differences between propane and natural gas, the subject of Oxidation and reduction atmospheres two subjects that aren't for the faint of heart. Reading about them can only confuse a person until they get a match and see how a blue or yellow flame can be produced, and how that blue or yellow flame will produce two completely different colors in your pottery. Soon you will learn if a flame is too yellow you will never reach a temperature to melt your pottery. We all know from what we have been taught that a blue flame is much hotter than a yellow flame. I can teach the difference these days! Next I needed learn about glazes and clay. Formulating glaze oxide ratios and converting them into recipes is a complex word problem to be solved. Most people don't think much about it, but our recipes for glaze and clays go back farther than the knowledge of reading and writing. It's important to remember that, we, the people of this earth knew how to make pottery way before we wore weaved clothing. Pottery is simply the broken down crust of the earth put together in the correct ratios and heated until it melts back into a stone. The earth does this all the time, we call it plate tectonics. Every time you see red hot magma spewing from a volcano, you see the same temperatures and materials I work with. Clay cannot be manufactured in a lab or a chemical plant. It simply takes too long. Every time you see a river pouring into the sea, it carries the salt from the broken down rocks in the mountains. That's why the sea is salty and the valleys of the earth are filled with clay. The differences between me, the modern potter, and the potter of the way, way back is: I have so much more to work with. In this modern world, I have the written knowledge of so many before me that have taken the wisdom of the past and put it in words allowing each generation to continue the growth of a process for a product. In the past, a person had to work with only local wisdom and raw materials and, in most cases, both of low purity and quality. Now days, I can obtain raw materials from around the world in about any purity I could request. Of course, that purity will come at a price: a man must be paid for his time. So in this modern world, I luckily have the knowledge of the ages from around the world on the internet, and the raw materials of the same quality to work with. There is no reason to think that I could not make something that no person has ever made before. Who would have known back some twenty-five years ago, I could be so successful at this time in my life. As explained on the about the potter page, when I started this journey of Stoneware pottery, I was a single man that had just lost his first love to cancer. Since that time, I have gone on to marry a fantastic woman, Gina Pratton, and have two very bright and beautiful children. The oldest, Alex Pratton, is now twenty years old, and he's a Sailor in the U.S. Navy. The youngest, Jessi Pratton, is now completing her last two years of high school with great grades. We, as a family of four, have been so lucky as to live on three acres at the end of a dead end street for the last fifteen years of this journey. Both of my children will be able to graduate high school with the same people they started kindergarten with. I'm so happy that Gina and I have been able to give that to our children. Way back in the day, when I first designed my kiln I had never fired a kiln and had no idea of what a glaze recipe or formulation would even require. When I first had the bright idea to build a kiln, I just thought I would use some old red bricks laying in my yard. Now I can, and have, melted red bricks. Over the past twenty-five years, I have earned the right to claim myself a Master Potter. It took me over ten years to develop a red glaze: it's the hardest one throughout history. I have glazes now that are mat, glossy, crackle Shino Smooth and broken. I think I have made every color and texture I have ever wanted to date, with still so much to learn. Learning is the journey of growth and improvement. If my work is to continue, I as a potter must continue to grow and change over time. This is Tom LaRoe way back in 1988; one of my closest friends for a lifetime. He and I have built things from the time we were under the age of ten, and we still enjoy building together any chance we get. He and his wife Lorna Dillan-LaRoe are my biggest collectors over the past twenty-five years. By far, they have much more of my work than I do. I was the crazy one to sell my best work, and Tom and Lorna have much of it! They are still collecting and I'm sure they have work from every year I made pottery.